The national flag of The Netherlands is one of the most recognizable in the world. Its three horizontal stripes in the tricolor red, white and blue hold a rich history and influence with origins as far back as the 16th Century. Its early version, “Prince’s Flag” or Prinsenvlag, featured an orange, white, and blue color scheme and was modeled after William Prince of Orange – who led the “low country” revolt against Spain’s rule – coat of arms. By the 17th Century, the Prinsenvlag evolved into the “State Flag” or Statenvlag, with the orange replace with red, and became the official naval flag of the Dutch Republic. Though no true consensus on why the orange became red exists, there are a handful of theories, from a lack of orange dye to the color being prominently associated with Scotland’s House of Stuart. One of the country’s first flags, however, featured the Cross of Burgundy, which represented the region’s united provinces under the Duke of Burgundy. The Cross of Burgundy flag was used during the mid-latter parts of the 15th century until 1572 when the aforementioned Prinsenvlag was adopted. The Statenvlag came into use in 1630 until the French conquest of the Batavian Revolution. Under foreign rule, the Prince or State flags were forbidden, ultimately replaced by the flag of the Batavian Republic. This flag was also colored in bands of red, white and blue, but featured the emblem of maiden and lion in its upper left corner. Upon regaining independence in 1813, a new flag was put into use, which coincided with the return from exile of the current Prince of Orange, and a newfound national pride. This flag was virtually identical to the Statenvlag with slightly lighter shades of red and blue used. On February 19, 1937, Queen Wilhelmina issued a royal decree establishing it as the official Dutch flag. As the world’s oldest featuring the tricolor scheme, the flag of The Netherlands’ influence can be seen far and wide. It is the primary influence for both the French and Russian flags, which in turn influenced a slew of countries including Croatia, Slovakia, Slovenia, Serbia, and the Czech Republic. Of course, its influence also includes flags of former Dutch colonies like Sint Maarten and The Netherlands Antilles, as well as locations of economic relations. A prominent example of this is the Prinsenvlag-esque design of New York City and it’s mayor’s office flags. With such rich history, we got to thinking, what about the flags of municipalities within The Netherlands? What kinds of stories do they tell? With that, we looked at seven of the country’s prominent municipalities and dove into their respective flags and coat of arms to see how far back their legacies go. Instantly recognizable throughout The Netherlands and abroad is the iconic flag of its capital, Amsterdam. With a simple design, striking color contrast, and triplex midsection, the flag is both historical and appropriate in its structure and legacy. Modeled after the city’s coat of arms, Amsterdam’s flag features two red stripes, top, and bottom, with a single black band representing the river Amstel cutting through. This black band holds three St Andrews crosses, which also feature on the coat of arms. For Amsterdam’s coat of arms, the triple St Andrews crosses appear vertically on its shield. The shield is held on either side by two golden lions. The lions were added in the 16th Century. Topping the shield is the imperial coat of arms, which came in the 15th Century. This imperial crown belonged to Holy Roman Emperor Maximilian 1 who was the beneficiary of many loans from the city. If you look closely, you will see the imperial crown all over the city, from Westerkerk to the Blawbrug Bridge. Underneath it all, Amsterdam’s motto: Heldhaftig, Vastberaden, Barmhartig or Valiant, Steadfast, Compassionate. Like Rotterdam’s, the motto was presented by Queen Wilhelmina in 1947 in remembrance of the Amsterdam citizenry through World War 2. Eindhoven’s flag features a bicolor, red and white color scheme. The flag features two vertical lines, one red, one white, on its left edge with five alternating red and white lines stemming of the white vertical line. These five stripes represent the five former municipalities – Woensel, Tonelre, Stratum, Gestel en Blaarthem, and Strijp, that merged with greater Eindhoven to create the municipality, as it exists today. Local architect, Louis Kooken, whose buildings can be found throughout the municipality, designed the flag. Prominent examples of his work in the city include the tower of St Peter’s Church and Gasfabriek. Matching the flag’s color scheme is Eindhoven’s coat of arms. A simple escutcheon topped with a gold crown, it features a Dutch lion and three horns. The coat of arms dates back to the 13th century where it featured without the crown, before being adopted in the 17th Century. Adopted in February of 1950, the flag of Groningen represents its two historical parts – the Saxon city of Groningen and the Frisian rural areas, or the Ommelanden region. One of the more colorful and involved flags of all the Dutch municipalities, Groningen’s features four colors – red, white, blue and green. The red, white and blue derive from the Ommelanden coat of arms, while the white and green are the colors of the Groningen town flag. Its green cross represents the town of Groningen as the center, and capital, of the province. Groningen’s coat of arms can be traced back to 1595 when the city and the Ommelanden regions came together. Its escutcheon features the heraldic shield of Groningen in two quadrants, as well as Ommelanden. Embedded within the escutcheon’s of Groningen is a third, that of a silver field and green fees. In Ommelanden’s, the diagonal blue lines represent its three regions (Hunsingo, Fivelingo, Westerkwartier), and eleven hearts representing subregions. On either side of the escutcheon are two lions, representing The Netherlands, and a heraldic crown tops it. Er, great-nieces Boven Groningen or Nothing Tops Groningen has been the city’s slogan. Simple and fun with double meaning…it is the largest city in the north of Holland after all. Moving south to the beautiful university city of Leiden, the flag is also based around the city’s coat of arms. With a single white stripe cutting between two red ones, it adds interlocking keys embedded within a red-outlined circle. Also holding origins in the 13th century, when the interlocking keys first appeared, Leiden’s flag is heavy on religious symbolism, specifically toward Saint Peter. Known for holding the “keys to heaven” Saint Peter frequently appeared across Leiden imagery during the time. As a result, Leiden is known as The Netherlands’ “key city”. Maastricht’s, the capital city of The Netherlands’’ Limburg province, flag features a single white star within a red field. 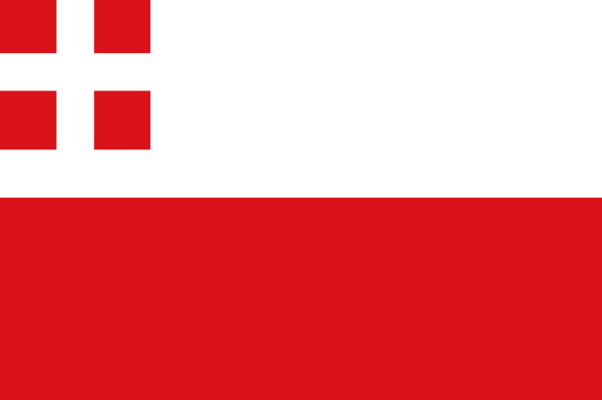 First appearing back in the mid-16th century, the red and white design was replaced in 1938 with a flag similar to that of Poland – white stripe atop a red stripe of equal size – before being reinstated in 1994. Despite its similarities and connotations, the flag of Maastricht has no communist connotations, which originally caused its 1938 replacement due to its similarity to that of the USSR. Maastricht’s coat of arms, on the other hand, is a multi-layered and symbolic image that dates back to the 14th Century. Then, it was a simple sign but by the 15th Century, the white star on red background became the foundation of the city’s shield. Holding the shield is a standing angel, which is believed to represent the Virgin Mary. Maastricht’s city slogan is one that is straightforward and particularly positive: “de stad van Het Goede Leven” or “city of the good life”. Who is from there? Is this true? Adopted in 1949, The Netherlands’ second largest city’s flag is another simple design. It features a single white stripe cutting through two green stripes, a color scheme also featured on the city’s coat of arms. This scheme dates back to the Middle Ages where the green represented the prominent Court of Weena (a fortified tower situated in the now city-center). The flag’s white stripe represents the city’s eponym, the Rotte River. On the cities coat of arms, the green and white stripes feature vertically with four lions topping the escutcheon. 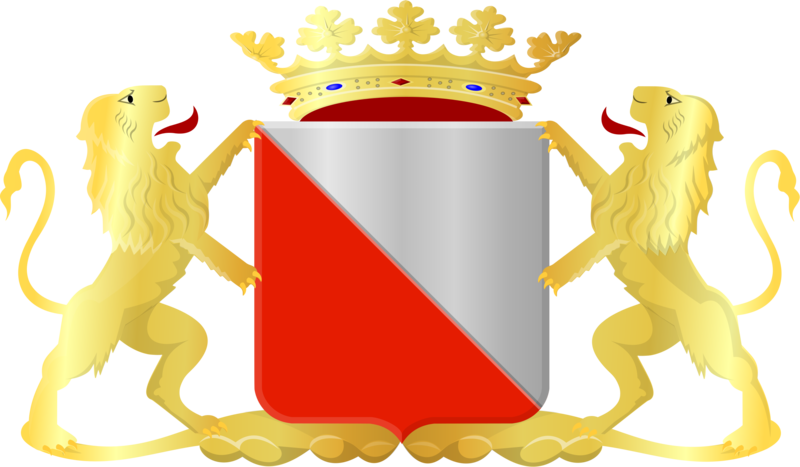 Two red and two black, the lions represent the support of the Court of Wean from William I, Count of Holland and Hainaut for the former’s support in the 14th Century fight against Flanders. The red lions represent the Dutch while the black represents Hainaut. Propping the escutcheon are two golden lions standing on a stone pedestal, added in the 16th Century. 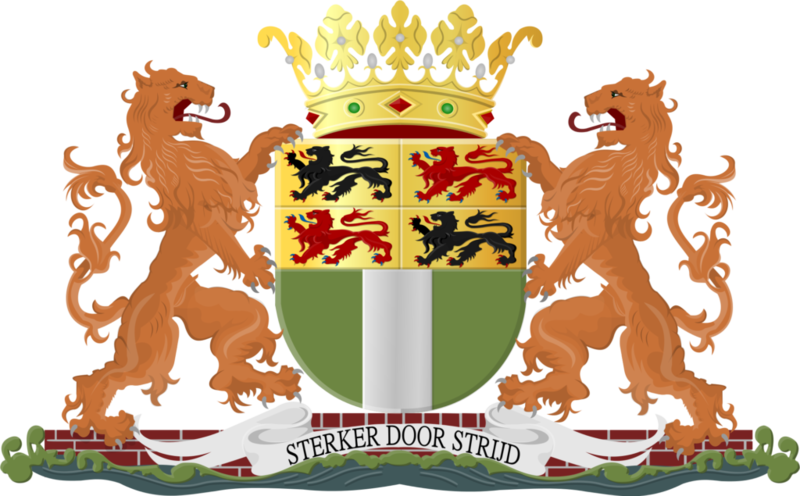 Finally, in 1948 Queen Wilhelmina presented the cities official motto: Sterker door strijd or Stronger through effort in remembrance of Rotterdam’s citizen role through World War 2. Adopted in 1952, the flag of Utrecht breaks the streak of a single through double stripe motif of many a Dutch municipality flag. Like that of Eindhoven, the flag features a simple red and white color scheme, Utrecht’s flag consists of two, equally wide horizontal stripes – one white and one red. In the top left-hand corner sits a red square with a white cross within. The flag of Utrecht continues the legacy of the smallest Dutch municipalities bishopric origins in combining the flags of the Archdiocese and Archbishopric of Utrecht, which date back to the 8th Century. Utrecht’s coat of arms incorporates the flag’s red/white color scheme in its shield. Represented as a downward, left to the right line, the shield represents Saint Maarten who cut is the coat for beggars. On Either side of the shield stand two golden Dutch lions and, as many municipality coats of arms, is topped with a golden crown. The coat of arms, as it now features, can trace its origins back to the 16th Century, where it took over from the middle age era castle insignia.